On this episode, Chris, Ben, and Dominic look back on the first day of Star Wars Celebration Orlando. 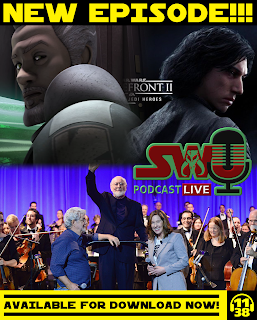 They share their thoughts on the 40th anniversary panel, Dominic gives a recap of Dave Filoni and Pablo Hidalgo's "Animated Origins and Unexpected Fates" panel, and the guys talk about the experience of lining up for the big panels and how some of the problems can be avoided in future years. Plus, Dominic chats with Starlight Children's Foundation CEO Chris Helfrich about some of the new Force for Change initiatives Starlight is launching, Episode IX has a release date, and another look and Rey and Kylo's The Last Jedi outfits. All this and much more! Can you post a link to that cast picture you mentioned with the Force ghosts photoshopped in?